The Purple Rain star, 57, was found dead at his Paisley Park studio in Chanhassen, Minnesota on 21 April (16), and next Friday (06May16), Los Angeles Mayor Eric Garcetti will host a memorial for the legend. 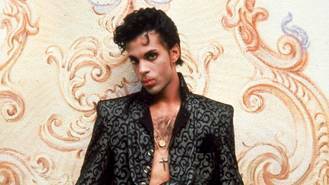 The event will be held at Los Angeles City Hall, where Prince filmed his music video for 1991 hit Diamonds and Pearls. The building has been lit up with purple lights in honour of the star since his passing. Mayor Garcetti praised Prince following his death, releasing a statement which reads: "Prince was a once-in-a-generation talent. His genius on stage, and in the studio, was matched only by his determination to protect the integrity of his art and defend the rights of artists to control what they create. "Memories of his work take me back to my childhood - and years later, I had the good fortune to witness his brilliance during an incredible performance at the Roosevelt Hotel. That night, I spoke to him briefly about my admiration for his music. Today, I join people in Los Angeles and throughout the world in mourning the loss of a true icon." Meanwhile, Prince's half-brother Alfred Jackson has spoken out for the first time since his sibling's passing. He tells Entertainment Tonight, "I miss my brother, because my brother was everything in the world to me. God bless Prince, God bless the world. He's a legend, he really is. He was a genius." A Minnesota judge recently placed bank bosses at the Bremer Trust, National Association, in charge of Prince's estate after determining the superstar died without a will. The singer's sister, Tyka Nelson, asked a state judge to appoint her as a "special administrator", and insisted she would be an heir to her brother's fortune, while their five half-siblings were potential beneficiaries too. Prince's assets have reportedly been valued at less than $150 million (£104 million), according to TMZ.com.